Our approach to terms and conditions is unique and personalised. We understand that your business has its own way of operating, and we do not adopt a cookie cutter approach. We stay on the front foot of advancements in business law, including changes to the Australian Consumer Law (ACL) (which can apply to B2B transactions) and understand how terms need to be worded in order to reduce your exposure. Our approach involves finding out about how you do business so that we can advise you on what terms you need to put in place, including what industry specific terms should be covered. We will start off by getting an understanding of your payment terms, delivery terms, insurance terms, warranties, timeframes and any applicable industry specific laws or requirements. Following that, we can put together terms and conditions that can either be used for a bespoke arrangement or as a template, such as with a schedule or a purchase order/quote attached. No refunds to the extent provided by law. 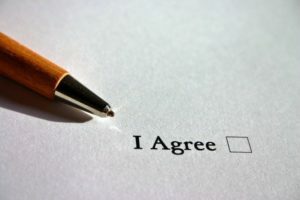 Beck Legal understands your business and is happy to prepare your terms and conditions your way. Whether that means you want your terms to be limited to key terms that will fit on one page, or whether you want all potential scenarios covered, we can prepare terms that will suit your needs and be acceptable to your customers. For more information about our business services, get in touch today.